There’s been a lot of discussion in the business world about the New York Times’ 3rd quarter losses. The media giant remains a powerhouse in the American news industry, yet its print circulation and associated advertising revenues continue to decline. Many commentators are focusing primarily on the negative aspects of this headline, but they’re missing the glimmer of hope within the subtext: the NYT Company’s online advertising revenue increased by 15% during that time period. According to the available data, the boost can be attributed to a rise in so-called display advertising as opposed to the CPC variety. With this information in mind, it would seem appropriate for them to make a big announcement, especially since they’ve been steadily losing ground for several years. As the saying goes, out of every crisis comes an opportunity. In this case, the NYTs could shrug off these figures and use them as motivation to revitalize an online only branding campaign. They’re clearly not making any money off of their print edition because, NEWS FLASH, print media is officially on life support. Some may even argue that it’s already flat lined. This doesn’t mean that books or magazines will cease to exist in the next couple of years. There will probably always be a market for physical copies of novels and scholarly journals, for example. But breaking news is an entirely different animal. 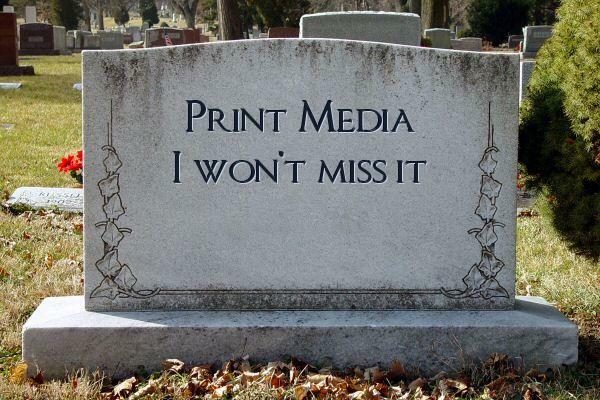 Today’s consumers expect instantaneous reports that printed newspapers simply cannot provide. Television news broadcasts have a difficult time trying to keep up with latest stories. By the time the morning paper comes out, nearly all of its content feels like, well, yesterday’s news. But instead of taking cues from the online advertising revenues, NYTs Company CEO Janet Robinson again voiced their commitment to keep hope alive for the print edition. At least their publisher, Arthur Sulzberger, acknowledged that the end is near last month. Apparently Robinson isn’t ready to accept the reality of the situation just yet. Until she does, her investors will continue to divert resources into thriving online marketing campaigns. Maybe by next quarter, Robinson will be ready to follow their lead. Last month we discussed some financially needy California schools making the decision to display advertisements on campus and buses. This bold move may have sparked a nationwide trend because now several Minnesota school boards are considering opening their schools up to advertisers as well, particularly on lockers. Once again, some parents are concerned about a potential distraction from their children’s educations. Supporters acknowledge this legitimate gripe, but note that these district would be able to earn approximately $184,000 per year from this proposal without lifting a finger. That money could be used to hire up to six teachers, considering that the average annual salary for beginning educators in that state is just under $30,000. Administrative officials also caution that they are only considering entering into a 1 year agreement, which should put parents at ease. Naturally they will not choose to renew the project should any significant problems arise. Additionally, he school board will exercise complete control over the advertising content, so the kids will never be subject to inappropriate content. A few board members are expected to vote no despite these protections, but other sources say that most parents approve of the idea. With schools facing even more cutbacks next year, advertising on campus for money seems like the least of their worries. However, the naysayers may not have fret for very long because advertisers have been known to cancel these agreements of their own accord. Marketing to teens is always challenging, and not all campaigns have proved worthwhile for the promoters. Obviously, the ads are targeted towards their intended audience, but traditional marketing techniques such as display banners aren’t always enough to capture kids’ attention. Advertisers find themselves competing with texting, social events, and Facebook on campus. Today’s teens are so desensitized to billboard ads that they barely notice that their locker sports a Coca Cola logo. Besides, kids depend on their parents for cash, so their direct purchasing power is relatively minimal. The Wall Street Journal has been running an extensive series of articles about highly effective internet marketing tools such as tracking cookies. Their motivation seems unclear since these techniques are hardly new to the e-marketing world. Nevertheless, this probing led to an unsettling discovery involving Facebook’s wildly popular apps. It seems these apps have been relaying sensitive user data to third parties for advertising purposes and privacy advocates are crying foul yet again. While this news is unsettling since information was shared without regard for user’s privacy settings on the site, this whole issue is being blown way out of proportion. First off, no one joins Facebook to maintain anonymity. Everyone on the internet today either needs to come to grips with data collection or simply log off. Period. Advertisers utilize these methods because they produce results, not out of some perverse desire to record people’s mundane browsing histories. Besides, this type of information generates targeted ads that users are free to ignore. There is nothing sinister about narrowing content to reach a target market. Television broadcasters employ similar methods, although their platform only permits them to do cater to a presumed demographic group on a large scale. For example, NBA basketball games are accompanied by commercials for products including Axe, Old Spice, and Gatorade. In other words, the ads are designed to appeal to male viewers of various age groups, from teens to middle aged. This practice doesn’t seem to raise any eyebrows, so its online equivalent shouldn’t make any waves. It’s also worth noting that this has been taking place for quite some time without any users even noticing. This fact indicates the benign nature of a largely media driven crisis. Basically, if the Wall Street Journal hadn’t been reaching for a sensational headline, everyone would be playing Farmville as usual. As if a discussion of Facebook and Privacy rights weren’t ironic enough, there’s a trademark Facebook “Like” button at the bottom of the Wall Street Journal’s article. As of the time of 5:22 pm PST, 53, 407 Facebook users approve of this story in some manner. Obviously today’s confidentiality catastrophe will slowly fade into the distance, just like the last incident. Many media personalities predicted a mass exodus back in June, which never came to fruition because Mr. Zuckerberg is correct: Privacy is Dead. The Chile Mining crisis had people all over the world on the edges of their seats hoping for a positive conclusion. Everyone got their wish this week as the miners were rescued and in surprisingly good health. Throughout their entrapment, the miners were given various amenities to make them more comfortable, such as food, internet services, and fresh oxygen. Many of these items came from donations, including 35 pairs of Oakley brand sunglasses. The eyewear company gave them glasses to protect their eyes when resurfacing. After all, being encased in total darkness for 69 days makes even the smallest amount of light intolerable. Oakley products feature a highly recognizable company logo that was clearly visible in the midst of the rescue. This event equated to roughly 41 million dollars worth of free advertising, which has some onlookers questioning the ethics of this type of product placement. No one can be certain as to whether the company’s good will gesture was motivated by branding concerns or genuine human compassion. They have yet to publicly comment on this issue and have not made any attempts to draw attention to this matter on their own. In fact, it appears as though the only people hyping things are the critics themselves. It is entirely possible that Oakley’s purpose reflected a marketing ploy, but this seems unlikely as they have a history of supporting charitable causes. Besides, they have not made a concerted effort to draw attention to their donation. While silent advertising isn’t unheard of, it would seem counterproductive in this instance. People watching the rescues were probably not paying attention to the sunglasses, so Oakley’s strategy would not have been effective without some effort on their part. Still, Oakley’s intentions are really not relevant to this discussion. The glasses protected the miner’s vision, which is undoubtedly an important point. This illustrates the fact that Oakley delivers a superior product and they should not be scrutinized for doing so. Here at Admedia, we’d like to offer our thanks to Oakley for lending a helping hand. Keep up the great work!